The billionth iPhone app was downloaded from Apple's App Store shortly after 5 p.m. ET today. All of those App Store downloads took place in only 9 months, so that's about 5.5 million iPhone app downloads per day, on average. Last summer, Apple sold one million 3G iPhones worldwide across 21 countries in the first 3 days on sale. 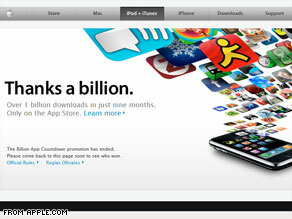 During that same time, iPhone users made 10 million app downloads from the then newly launched iTunes App Store. With about 30-35 million iPhone and iPod touch devices in the market, that suggests the average person has downloaded about 30 apps. That's a lot! Most mobile users download zero apps on their phones. The iTunes Store was showing up as unavailable for several people off and on throughout the afternoon. Even Apple itself jumped the gun a little bit by having its after 1 billion page already available early Thursday, in addition to the counter in iTunes showing the 1 billion mark before the official counter on Apple's website. In honor of the milestone, I pulled in a few lists of the best iPhone apps. What do you all think of them? Tell us in the comments. How do you use iPhone apps? What’s your favorite? Tell us about your iPhone app experience! I understand that the public was the first to file a suit in order to make the copyright law more clearly defined but apple's counter-suit goes way beyond the realm of necessity and can only be considered malicious greed. I have been an avid Apple user since my first computer, a mac LX, and have long-time been a supporter of apple. I have touted the superiority of the os and defended the higher price of your computers, but not any more. My word of mouth campaign has made a 180 degree turnaround. Apple has proven that they are only about greed and profits no different from microsoft. I will now sneer at mac users just as I had Microsoft users of the past. You should be ashamed of your business ethics and personal greed. I was on the fence with your Itunes product and some of the issues with it but the whole Iphone apps issue has made me sick and I can't believe I ever praised what has now become a monster. Maybe Gates having part ownership of apple is like a worm, and involvement with intel and at&t a diseased core. Thank goodness for open source, Linux, GNU. I hope that programmers who once left you and your operating system alone because of your innocence now create terrible viruses to cripple you. Rotten to the core, the juice may be all that is salvageable.